Half-Hour Hegel: The Complete Phenomenology of Spirit (eventually): Public Q&A Session for March! 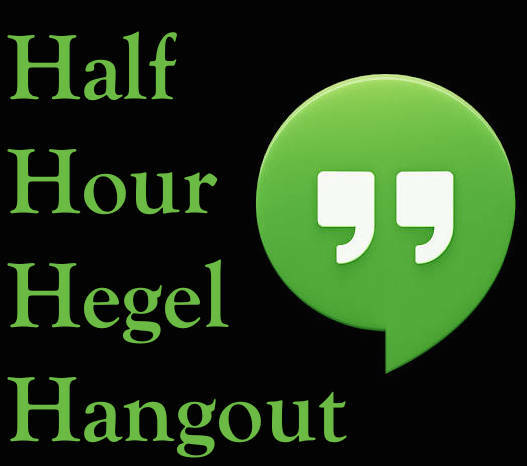 We're holding the next Half Hour Hegel public Q&A session a bit later on this week - Wednesday from 5:00 PM to 6:00 PM Central Time. This is a public service that I offer as a way of giving back to the online intellectual community. It's effectively underwritten by my Patreon supporters (and I do offer a second, exclusive session later on in the month for them). If you've got any Hegel-related questions - and if you're reading Hegel, you likely do! - then by all means, join in and ask your questions, and I'll do my best to answer them. You can access the online session at our ReasonIO meeting site. Hopefully, I'll see you there!